US President, Donald Trump, has threatened to withdraw from the World Trade Organization. Trump, in an interview with Bloomberg News, said he will pullout from the organization if it “does not shape up”. The US president warned that he could even take action against the WTO. Trump has complained that the US is being treated unfairly in global trade and has blamed the World Trade Organization for allowing it to happen. Regarding tariffs, Trump said he will enact import duties on 200-billion dollars-worth of Chinese goods as early as next week. Following his remarks, Asian stock markets dropped and partially erased gains made in this week’s global rally. Trump has ignited a global trade war by slapping sharp tariffs on goods from the EU, Canada, Mexico, and China. PressTV: What is your take on this? PK: Well, it looks like this latest threat to exit WTO goes into the same direction as his trade war with the EU and with China, and also with the new NAFTA Agreement – which so far was negotiated only with Mexico and does not include Canada; it eventually would have another name. The new trade agreement with Mexico was negotiated like all trade agreements with the US, behind closed doors. Canada was invited to also join, but as far as I know, no decision has been taken yet. At the outset it looks like the new “draft” agreement with Mexico is worse than the original – with all the rights and benefits going to big US corporations. In the case of Mexico, it is really only a “draft”; nothing has been accepted yet. It will be subject to Mexican approval once the new President, Andrés Manuel López Obrador is sworn-in in December 2018. What Trump is doing – or attempting to do – with tariffs and with sanctions – is dividing the world, breaking up alliances, i.e. trade alliances in the case of WTO. It’s the old rule: “Divide to Conquer” – and conquer in this case means that when alliances like WTO – in the creation of which – by the way – the US and the EU were instrumental – are broken up, the US will engage in bilateral agreements with individual nations – like in the case of the “new NAFTA” – negotiating with Mexico alone, dictating her terms to weaker nations. If Canada will be ready again for a NAFTA-like agreement, the process will be similar, with Washington in the driver’s seat. What transpires from these negotiations, or tariff impositions – like China and the EU, or even the reneging of the Iran Nuclear Deal – is Make America Great Again, meaning really American Corporatism, not the people. New bilateral trade deals will continue to allow bilateral outsourcing to cheap labor countries, for example between the US and Mexico – and the export of highly subsidized US goods. In the case of agriculture, NAFTA killed hundreds of thousands of small farming businesses in Mexico – which was one of the key reasons for the massive increase of illegal migration to the US. This will hardly be different in a new agreement. That’s why nothing is done yet. The progressive new President, López Obrador, may not easily submit to a flagrant one-sided agreement. The case of tariffs on China for 200 billion worth of merchandise – has a different purpose – namely to degrade the value of the Chinese currency, the Yuan, which is emerging rapidly as one of the world’s foremost reserve currencies, to the detriment of the US dollar. The Trump move is meant to discourage countries to adopt the Yuan among their reserve currencies. Some success was indeed registered by Trump’s announcement – the Asian markets dropped drastically wiping out much of the gains made during last week’s rally. This, however, will be short-lived, as investors realize the hot air behind the threat and that these tariffs will really make hardly a dent in China’s economy which is dominating the Asian market and doesn’t really depend on exports to the US. If the US would indeed exit WTO – which is by no means sure, since Trump likes to play god, threatening, fearmongering – and then negotiate under conditions of intimidation and coercion – so, if the US would actually get out of WTO, they – the US – might set themselves up as sort of a competitor to WTO, negotiating individual bilateral deals with nations – especially weaker ones. 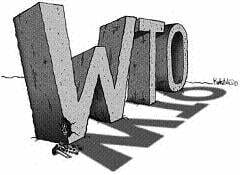 They would no longer be under the oversight of WTO – and as with the International Court of Justice – to which the US does not belong – complaining would be meaningless.